A comforting one pot dish for those days when you want quick hot meal in minutes. Loaded with the goodness of greens this is a great dish for lunch. You can add any combination of vegetables frozen of fresh, just make sure they are green ones (for this recipe). Mint adds the unique taste to the pulao. 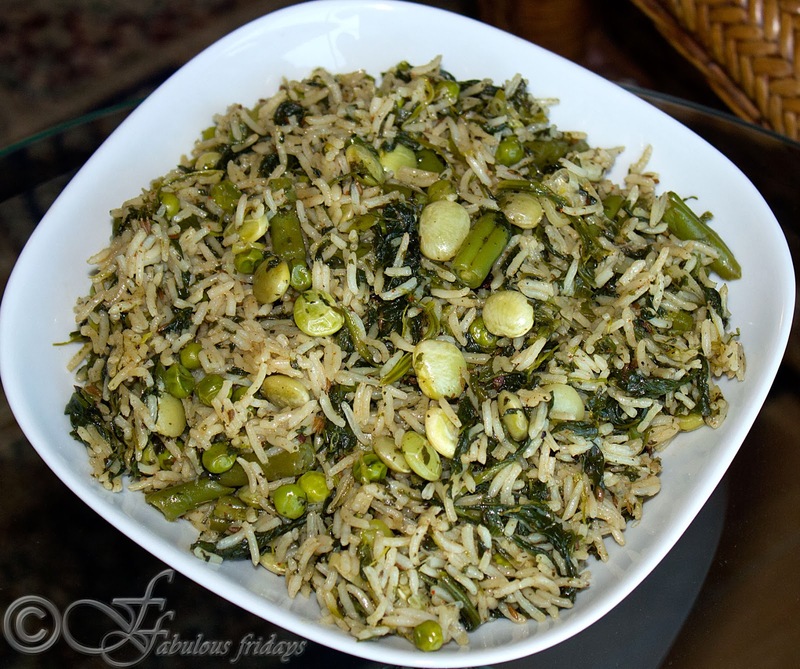 To get a green color, avoid adding any fried onions as they will color the pulao brown. In a heavy bottomed pan heat oil and add cumin seeds. Roast for 30 seconds. Add rice and stir to coat each grain with oil. Add all the leafy greens and cook for 2 minutes. Now add all the other veggies and water. Cook on high till it reaches a rolling boil. Simmer and cook covered and undisturbed for 9-11 minutes, till all the liquid is absorbed and rice and veggies are cooked. Now gently mix to evenly distribute the vegetables in the rice. Serve hot with green chili pickle and cucumber raita.